Last Friday was “Black Friday,” the day after Thanksgiving, the start of the holiday shopping season. It is also, by popular lore, the day retailers annual balance sheets tip into the black, all further revenues for the year are profit. It is the busiest shopping day of the year, and over the years, retailers have done more and more to make sure that shopper’s enthusiasm isn’t left to chance. Extreme loss leaders, like various consumer electronics at discounts approacing half price are common place, though only available in limited quantities. Throw in a few weeks of increacing hype by the media, and on Friday morning you have people in front of malls and people waiting in line for the better part of a day. It’s hardly surprising then when they start to act like a mob, as they did this past Friday when a mob of shoppers broke through the doors of a Wallmart, injuring shoppers and workers and trampling to death a temporary worker. Of course the greed and callousness of the crowd is repugnant, but what of the retailers who foment a riot to try and drive sales. Wallmat itself is cuplable here, and the entire industry stands alongside them as codefendants, with much of the media as witting accessories. Certainly going forward, when the next Black Friday casualties are tallied, none should be able to claim that they didn’t know the evil they were summoning. This entry was posted in General and tagged black friday, greed, wall mart on November 30, 2008 by eas. 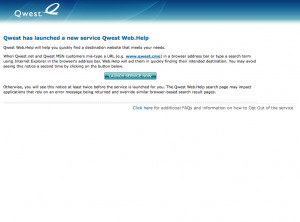 I guess this may have started a few months ago, but I just noticed today that Qwest.net, my ISP and DSL provider, has started hijacking incorrect domain names. The way the interenet is supposed to work, is that when you click on a link in your browser, or type in a url, your computer asks a nearby DNS server (usually at your ISP) what IP address is associated with the hostname (ie geekfun.com). The DNS server asks a succession of other DNS servers for the answer. If it doesn’t get a satisfactory answer back, it lets your computer know that there is no IP address associated with the name. Whatever application you are using can then decide how best to handle the error. If the DNS server tries to get clever, and provide an IP# of one of the ISPs webservers instead, you get deprived of a useful error message. Other ISPs have been doing this for a while. They position it as helpful service, but in actuality, they do it because they get a cut of ad revenue on the pages they redirect people to. 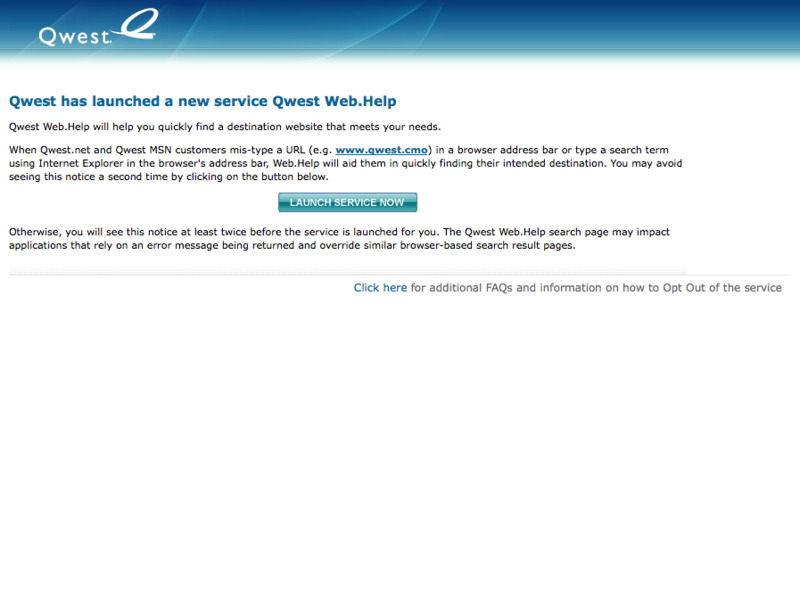 Qwest is taking a somewhat conservative approach in rolling this out. They aren’t hitting you with the ad pages right away, they serve a page telling you that they are going to start hijacking your typos (not that they are so plain-spoken about what they intend to do), and they give you an easy way to opt-out, which I’ve done. Still, one more thing to be aware of when trying to diagnose a name resolution problem. This entry was posted in General on November 18, 2008 by eas.